When scientists attempt to slip big molecules, like the Cas9 enzyme that is key to CRISPR gene editing, into cells, things can get messy. 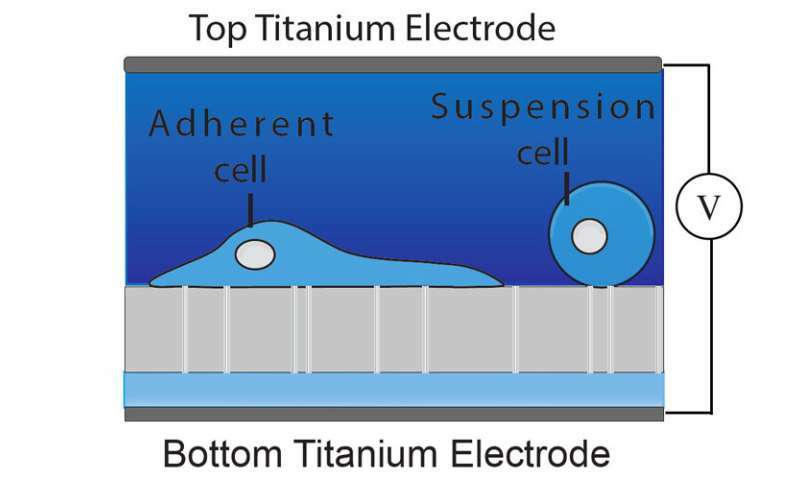 One popular technique, bulk electroporation, involves jolting cells with electricity. This blows holes everywhere in the cell, allowing anything and everything to get inside. Delicate cells, such as human T-cells, don't always survive the process. Instead of sending in large proteins, scientists sometimes send in the DNA that codes for the protein, which is more compact. For this, viruses often work, but most viruses still suffer from safety concerns in humans. And adeno-associated viruses (AAV), which have been approved for clinical use by the Food and Drug Administration, are too small to carry large pieces of DNA. A new technique developed by University of California, Berkeley, nanomaterials scientists overcomes these obstacles, using inexpensive lab equipment to efficiently infuse large macromolecules into cells. Called nanopore-electroporation, or nanoEP, the technique gently creates fewer than a dozen tiny holes in each cell that are sufficient to let molecules into the cell without traumatizing it. The pores heal rapidly afterward. In tests, more than 95 percent of the cells survived the procedure. "It is a simpler, safer, more efficient and less expensive method to deliver macromolecules into the cell," said UC Berkeley postdoctoral fellow Yuhong Cao, lead author of a paper about the technique published online this week in the journal Proceedings of the National Academy of Sciences. To create nanopores in a cell membrane, Cao adapted a standard lab item: an inexpensive commercial water filter with pores a mere 100 nanometers across—far too small for a hair to fit through. They're used to filter large particles or molecules from liquids. She grew cells on the water filter, then applied a very low voltage that created pores in the cell membrane only at the site of the pores in the filter. Typically, this produced about 10 pores per cell in a drop of liquid containing perhaps tens of thousands of cells. The voltage also pulls macromolecules on the other side of the filter through the pores and into the cell. "The technique allows effective delivery of various kinds of fluorescently-labeled functional proteins with about 80 percent efficiency," said Cao. She was also able to genetically edit a a cell line of human T-cells called Jurkat cells by delivering the Cas9 protein and guide RNA, both large ribonucleoproteins, while maintaining a high survival rate for the T cells. 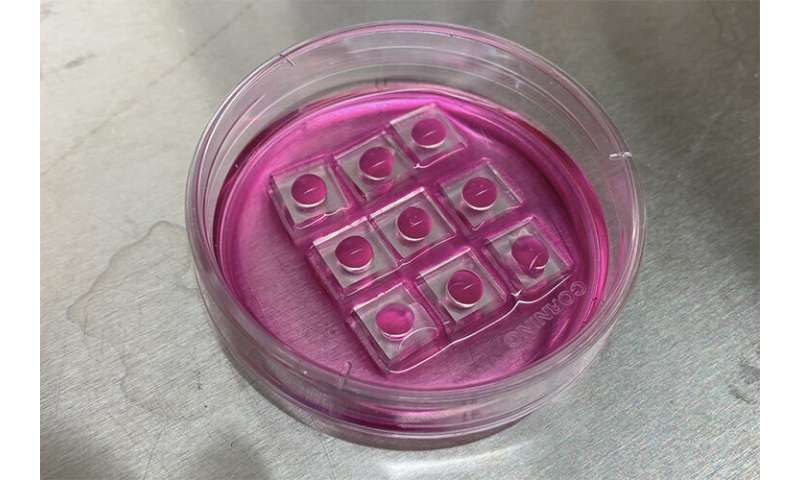 Tested so far only in immortalized cells, nanoEP should theoretically work with any type of cell, delivering macromolecules, such as Cas9, into an embryo, for example, or altering human T-cells for immunotherapy. And the delivery method does not require specialized equipment or buffer solutions. Cao's ultimate goal is to produce an inexpensive and easy-to-use clinical tool for delivering Cas9 safely and effectively for CAR (chimeric antigen receptor) T-cell immunotherapy against cancer.